As its title suggests, this is an ambitious volume, its thesis that mental disorders cannot be understood, let alone responded to, by any one discipline alone. Suffering and disability of these kinds emerge as the result of multiple factors, including the interlinked and equally important biological and personal, social and cultural. In the words of the editors, psychiatric problems "reflect the interactions of biological and sociocultural systems that can be described in terms of dimensions of functioning, developmental trajectories, thresholds of tolerance, and feedback loops" (Preface xxi). Because of their multifactorial nature, such disorders call on insights from anthropology, philosophy, and phenomenology, quite as much as from neuroscience and medicine. The problems of mental health and illness are "too complex and too important" as the editors put it, to be left to any one discipline; and contributions from each of these several disciplines find a place in Re-Visioning Psychiatry, a book that grew out of a 2010 conference held by the Foundation for Psychocultural Research designed to promote interdisciplinary exchange. With its goal of re-visioning psychiatry as an interdisciplinary or transdisciplinary "discipline" this way, the volume offers a remarkably persuasive alternative to the visions of medical psychiatry promulgated by Western medicine, big pharma, and all the hegemonic tentacles of orthodox medical scientific research. How does this multifactorial analysis improve on the old biopsychosocial model? The model proposed here is a dynamic "ecosystemic" one: interacting systems are "ecological" in involving "biological organisms embedded in and in constant transaction with the environment" at multiple levels (Preface xxi). Its emphasis on feedback loops and multi-level causation (readily afforded by neural plasticity), and dynamic exchange, introduces complexity and a stress on cultural structures and collective meaning-making absent from Engel's model. The context-dependence and attention to culture, with its inherent normativism, thus also exceeds the slight nod to social and cultural context found in DSM5, with its acknowledgement of the role of "culturally approved responses to stressors," for example. The reasoning in support of this expanded model is that mental disorders "are problems that affect our social roles and functioning, and what is expected of us in these roles depends on our culturally constructed institutions and forms of life" (Introduction, page 6). Detached from such social roles and functioning, the patient and her complaint simply cannot be understood. The work consists of twenty-four chapters, together with a 38 page Introduction by the editors, and a brief Foreword by Arthur Kleinman, who speaks of "re-socializing" psychiatry ("this troubled field") in such a way as to include neuroscience as the prescription to "revivify the intellectual as well as the practical sides" (Foreword xix). In a concluding chapter, Lawrence Kirmeyer describes how the complex, ecosystemic model proposed here accommodates contemporary hypotheses about cognition, mechanism and brain functioning, ending on a cautionary note: although the neural, cognitive-emotional, and social processes giving rise to psychopathology can be provided these very general descriptions that apply to all and every human, in any given instance, they reflect specific details of a person's very local place in the world: life history, cultural background, and social context. 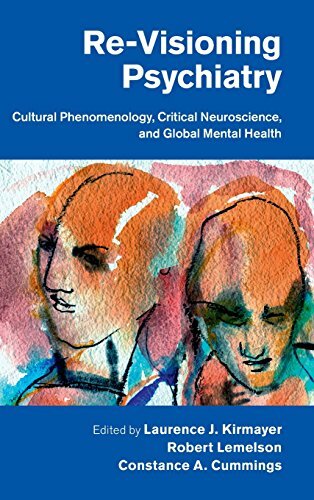 The subtitle indicates three parts into which this broad initiative can be divided: Cultural Phenomenology, Critical Neuroscience, and Global Mental Health. The first has been introduced above. Once we have acknowledged the central contribution of the cultural, a natural step leads from ethnographic concerns to the felt symptoms, personal narratives, normatively mediated insights and orientations that are the domain of phenomenological analysis, and chapter after chapter here offer particular, thick symptom descriptions, in addition to explicit defenses of the realm of the phenomenological. "Critical Neuroscience" or as it is also sometimes known "critical psychiatry," involves a collection of widely shared contemporary critiques of reductionistic DSM-type diagnostic psychiatry. Diagnostic models and treatment modalities have each been the subject of damaging attention: the challenge thrown out by RdoC leaves DSM diagnoses insufficiently scientific for research purposes, reducing their status to something close to "folk" categories. Studies have been widely recognized to show psychopharmacological treatments little better than placebo, and concerns over the unholy union of psychiatry and "big pharma" have become inescapable. It is because of insufficiencies and lacunae in traditional approaches that psychiatry must be "re-visioned" and in their various ways, the authors of particular chapters illustrate the dense, subtle, normative, dynamic systems within which particular forms of suffering and disability (such as eating problems in young Fijian women (Becker and Thomas), and panic attacks in Cambodian refugees (Hinton and Simon)) are situated. Like critical neuroscience, global mental health is an important contemporary concern, associated with research confirming the enormous worldwide costs of mental ill health measured as both human suffering, and economics, and encapsulated in the slogan that there can be "No health without mental health." In a final section of the book, a handful of chapters take on the multiple challenges introduced by thinking globally: about scaling up care, prevention and research while still honoring the particularities of local contexts, and avoiding the charge of cultural imperialism associated with efforts to impose Western-style mental healthcare worldwide. As a moral imperative, seeking global mental health makes laudable sense. But the impediments to delivering on that goal are profound, it is illustrated: particularly in today's global economy where, despite their limited effectiveness except as placebo, the use of psycho-pharmaceuticals is already widespread in countries such as India and Brazil - and in light of the embarrassing finding that recovery from severe disorder can often be more likely and more effective in non-Western settings. As Kalman Applbaum concludes in his important chapter on these issues, while it is possible that mental illness remains under-served, "…the utility of the global mental health movement may be even more threatened by the prospect that an overconfident and under-informed psychiatry may inadvertently transmit commercially rather than medically mediated solutions to needy populations around the world" (Appelbaum, page 565, emphasis added). Each author in this section on global mental health injects complexities of these kinds - ethical, political, economic and methodological - and in so doing draws out attention to the gulf between the high-minded rhetoric of bodies such as the WHO, and local realities. If there is a criticism it is possible to make of this comprehensive, careful, and impressive volume, it lies here, in the section about global mental health (GMH). The very scope of GMH, it has been recognized, will require the means and methods of public health, rather than the kind of clinical exchange between carer and patient that remains the luxurious centerpiece of Western psychiatry as we generally know it. (The "task shifting" proposed as a delivery solution, discussed by Kohrt and Griffith, seems likely insufficient, potentially sexist, since the tasks of care always fall disproportionately on women, and at risk of being cast as second best until the mechanisms by which healing occurs are better understood.) And that takes us beyond the goal of treatment to that of prevention, in the sense of primary prevention that anticipates and avoids known risk factors, many of which, as the kind of data assembled throughout this book attests, will be environmental and extra-individual, rather than inherent to the individual. Two issues need attention here: the balance of resources and efforts directed to care and treatment in contrast to early (primary) prevention, and the knowledge base on which such preventive initiatives must rest, i.e., the nature of the environmental risk factors to be eliminated. The issue of resource allocation to a great extent rests on the second, since efficiency dictates that insufficient and vague correlations between social conditions and health outcomes would be resources squandered. But the knowledge base is not inconsiderable, and growing. We do know, as Duncan Pedersen asserts in his fine Reflection in Chapter 23, that poverty, racism and social exclusion, material insecurity and stressful life events all affect mental (as well as physical) health (Pederson, page 616). These broader societal and cultural factors that have been correlated with mental distress and disorder have been part of the public health stress of GMH from its inception at the start of the present century (Saxena et al 2006). Correlations are cited involving public health measures around maternal health, social and economic wellbeing, nutrition, and literacy, for example, in accounting for improved mental health at the population level. Protective and risk factors have been identified (traits such as resilience, problem solving skills and social and conflict management skills are protective; risk factors include medical illness, parental mental illness, and emotional immaturity.) And broad, "macro preventive" measures have been advocated as the preferred approach to mental disorders within public health. Although they have long been neglected, and still remain under-emphasized within mainstream medical models of disease that posit the origins of disorder within the individual, environmental risk and protective factors contributing to these disorders are arguably better established than the individualistic idiopathic factors that have been the traditional focus of psychiatry (Saxon et al 2006). The lack of complete findings to undergird prevention as a public health strategy, and the relatively paltry allocation of resources to mental health, whether prevention or care, have been attributed to a combination of prejudicial social attitudes and ignorance (Rüsch and Thornicroft 2014). Yet questions of basic methodology arise here, too. Randomized controlled trials (RTCs), the gold standard for orthodox medical science, cannot be the appropriate measure for success in the public health arena, it has been observed, since preventive interventions use multi-component programs in dynamic community settings, and control of all the factors involved would be impossible. Arguably, then, the over-reliance on RTCs within "evidence-based" medicine is part and parcel of the diagnostic DSM psychiatry rightly criticized within the pages of this book. Public health methods and measures are not less scientific – but different: alternatives to RTCs include the use of quasi-experimental studies, with matching techniques to reach comparability between experimental and control groups, and time-series designs (Saxon et al 2006). Given the limited research yield from more strictly "evidence-based" RTC approaches within psychiatry, such measures may provide what is needed to redirect attention (and resources) away from treatment towards primary prevention. In his concluding essay Lawrence Kirmeyer asks whether "psychiatry" can survive as a free-standing category (or be swallowed up into a reductionistic neuroscience, other caring professions dealing the psychological and social dimensions of suffering). He assures us that it can -- if suitably "re-visioned." I am not so sure. What we know as mental disorder, disability and suffering will remain, certainly. But it is a testament to the compelling force of the reasoning and evidence accumulated in this splendid volume that I am not entirely persuaded that as a category "psychiatry" in any recognizable form can withstand this makeover – and I am not sure I'm sorry. Rüsch, N., Thornicroft, G. (2014). 'Does the stigma of mental illness contribute to suicidality? 'The British Journal of Psychiatry 205:257-259. Saxena, S., Jane-Llopis, E. & Hosman, C. (2006). 'Prevention of mental and behavioural disorders: Implications for policy and practice.' World Psychiatry 5 (1): 5-14.